At the beginning of January, Marcella Weichselbraun started her job as Store Manager of the Draupark INTERSPAR Hypermarket in Villach. 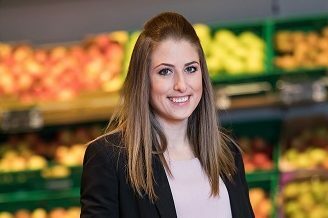 At just 24, she is the youngest INTERSPAR Store Manager in Austria, showing that young SPAR and INTERSPAR employees have countless opportunities for a successful career after completing a training programme at SPAR. Marcella first entered the retail market seven years ago as a trainee in an INTERSPAR Hypermarket in her hometown, Lienz. She completed her training as a retail merchant with great success, along with an office administrator training programme. Most recently, she worked as Regional Manager of the INTERSPAR Hypermarket in the Atrio shopping centre in Villach. As part of the INTERSPAR development programme for young employees, Marcella completed numerous additional training courses, including the SPAR Champion training programme. “All of these seminars and courses have strengthened my self-confidence and organisational and leadership skills. This has really helped me in my daily contact with my employees,” she said. After having finished their training, young SPAR and INTERSPAR employees have countless opportunities for a successful career. Many of today’s INTERSPAR Store Managers and Regional Managers have completed their training as retail merchants at SPAR. Those interested in following a SPAR training programme and joining the SPAR family can apply online on SPAR Austria’s job portal.